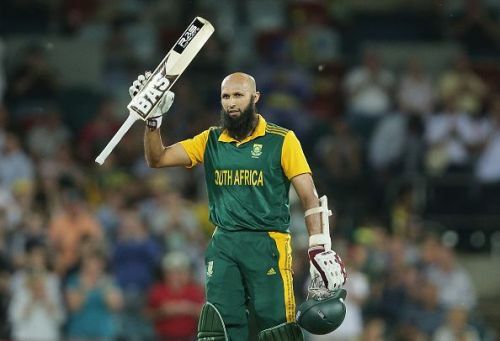 The word Monk is best suited for Hashim Amla. He is very calm on the field and shows no signs of aggression while batting, and still manages to scores so many runs. Off late, there has been a dip in his form but still, he averages close to 50 in ODIs. He has scored close to 8000 runs in ODIs including 26 centuries. On four of the 26 occasions, he has converted his 100 into a 150+ score. In the second match of South Africa's tour of England on a tough pitch, while batting first, Hashim Amla showed his class. He scored 150 from just 124 balls. His knock included 16 fours. Graeme Smith was the only other batsmen who scored more than 50 in that match. In the second ODI during the West Indies tour of South Africa, while batting first, South African batsmen went berserk. AB Devillers, Rillie Rossow and Hashim Amla got hundreds. Amla anchored the innings and carried his bat through the 50 overs, scoring 153 from 142 balls which included 14 boundaries. But, it was AB's day, as he scored 149 from just 44 balls. He broke the record of fastest hundred in this match, he scored 100 off just 30 balls. In the group stage match against Ireland in 2015 World Cup, he scored yet another 150+ score. The innings of 159 runs from just 128 balls included 16 fours and 4 sixes. In the fifth ODI of Sri Lanka's tour of South Africa in 2017, the opening pair of Hashim Amla and Quinton De Kock provided an excellent start. Both scored hundreds, and Hashim Amla went on to score his fourth 150+ score in ODIs. He scored 154 from 134 balls which included 15 fours and 5 sixes.